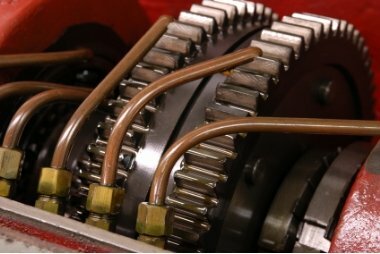 Automated machine lubrication systems will keep your machines well lubricated and in doing so will maintain peak efficiency. Also an added bonus, reduce mechanical failure downtime to an absolute minimum. Machine lubrication systems are a very important part of manufacturing and production workshop maintenance. That's perfectly highlighted by those factual statements above! Automatic lubrication systems eliminate the need for (often forgetful) “manual lubrication” providing a safer, more frequent and opportune monitored approach to machine lubrication. Once installed of course, automated machine lubrication systems deliver precise and measured quantities of oil, or grease directly to the required point of lubrication. In doing so they will be using less lubricant, without overspill and without consequential polluting the surrounding area, also resulting in extending the operational life of some machines by as much as 50% before requiring overhaul. There's just one tank to keep filled and it'll tell when that's getting low. Applies lubricant directly where it's wanted and not on the floor. Keeps the machine joints continuously lubed up without drying out. The wearing of a machine part, bearing or other element, whether it's due to fatigue or abrasive wear, will add contaminants in the form of particulates to the system. If a machine element is starting to wear out it will produce a large amount of particles and it will finally break down. Since this can be very costly, one can establish the need to monitor the system so that one can foresee failure. There are several different ways to monitor a lubrication system, measurements of the temperature, pressure, vibrations and even the degree of contamination. The purpose of all of these methods, alone or combined, is to extend the life of machine components and thereby save money. When monitoring a system it is very important that the monitoring control instrument should give the right output. One important factor in achieving this is the withdrawal of a representative oil sample. Dedicated and affordable electronic control and monitoring equipment is available to monitor and control the complete operation of all these systems. Retrofitting an automatic lubrication system after a machine failure due to an inadequate manual lubrication system, can be avoided. Installing Automatic Systems is not expensive and it is cost effective. The following types of automated machine lubrication systems are available for retro fitting to many types of machines. Oil re-circulation machine lubrication systems provide a continuous flow of oil to the lubrication point. The fast change-over of lubricant removes heat which allows increases in machine speed & performance as well as prolonging bearing life. The pumping station is equipped with cooling, heating, & instrumentation to maintain the lubricant at optimal temperature. Sophisticated flow control devices ensure consistent monitoring of the lubricant supply. Air/Oil machine lubrication systems is a relatively recent technology that is increasingly replacing environmentally unfriendly "mist systems". Oil is injected at regular intervals into the continuous air stream & coats the surfaces to be lubricated, thus reducing friction & wear. The air stream not only transports the oil to the lubrication point but also provides cooling. Such systems, which are often fitted with electronic feedback, provide a precise, clean, & economical way to apply lubricant to machine tools, bearings, gears, spindles, chains, & conveyors. Grease machine lubrication systems has a wide variety of applications ranging from woodworking machinery to steel plants & paper mills. We offer a large selection of pump packages together with many custom design options allowing any automatic greasing application to be developed reliably & cost-effectively. The modular design allows easy configuration & expandability of the grease distribution & monitoring system. Active components can be removed & substituted during maintenance without the need to disrupt interconnecting pipe-work. Re-circulating pump systems are usually custom-designed, these units pump oil to bearings or gears to flush, lubricate, remove heat & purge them of wear debris. This results in extended bearing or gear life, reduced plant shut-down, & increased oil change intervals. Flow rates range from 5 to 800 litres per minute, though most tend to be at the higher end of that scale where they are used in heavy industrial applications. Because such plant often runs 24 hours a day throughout the year we use only high quality proven components in the manufacture of these units. <!- Bottom page links --> Go back to Machine 'In the box' page. Go forward to Information 'In the box' page. Go forward to Systems 'In the box' page. Return from Machine Lubrication Systems to Home page.